Undo Send Zimlet: Delays mail-send for few(upto 20) seconds. If you have sent an email and immediately thought you shouldn't have sent it or want to change something and want to quickly undo, then, this Zimlet is for you. The delay time is defaulted to 7 seconds. But the amount of time to delay can be configured and can be from 3 seconds to 20 seconds. Click on the Zimlet in the overview panel to change it. Made it compatible with 7.x with Send Later option. The zimlet does not work with ZCS 8.7.1. When "Send" button is clicked, the message is not sent due to a script error. On the other hand, undosend zimlet on git works. Amazing Zimlet ! It helps us a lot. 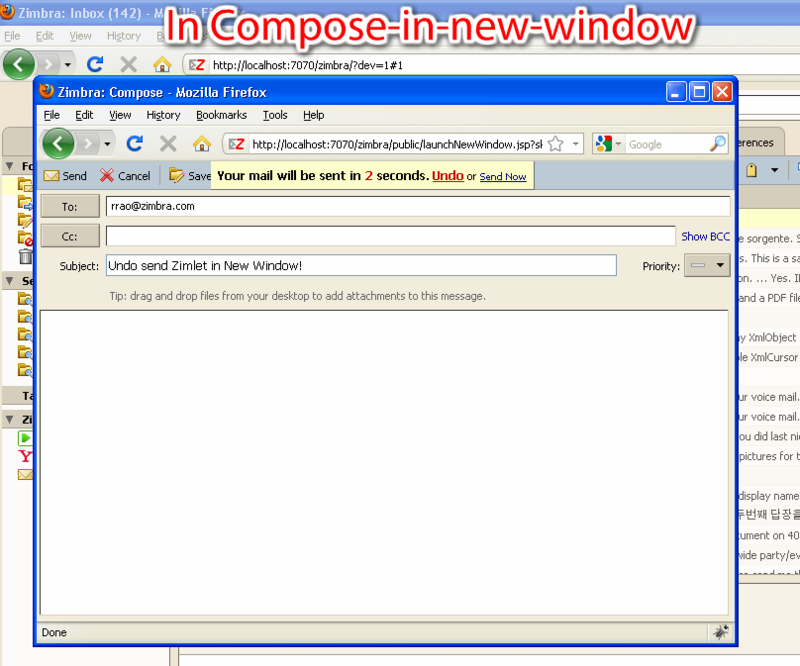 The zimlet worked great in Zimbra 8.7. Does this work with Zimbra 8.5_GA 3056? Since I installed Patch 5, this Zimlet block the Send button. Do you think there will be any updates on this wonderfull Zimlet ? Great work! It works fine. Thanks. 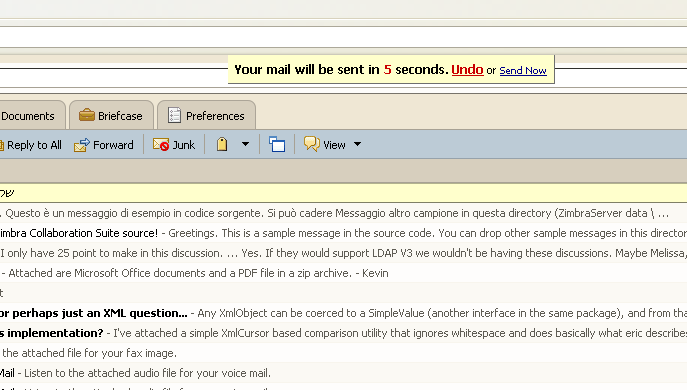 When you forgot the subjet of your e-mail, another poppup window warn you, then the undo send Zimlet does not pop up ! The only way that I send emails is with CTRL+Enter. This doesn't trigger when I hit that button, if you make it work with the shortcut it'll be one of the best zimlets. Don't know if it's becuase we're on 7.2, or because we have automatic spellcheck enabled, but the Undo Send dialog never appears regardless of the the number of seconds set in the preferences. It just works. Not much to tell about it. I mostly use the shortcut ctrl+enter for quick send mail but i can't work with thismy version 8.0.7 Hop rrao will update this. Zimlet successfully deployed, but button Send not affected. Not working with Zimbra OS 8.0? Hi! I loved this Zimlet, worked fined until I upgraded to the latest Zimbra Open Source (8.0.1_GA_5438.FOSS).Now when the Zimlet is enabled, the send button doesn't reply? Anyone with this issue? Yeps needs to be active on the keyboard shortcut to be really usefull ! Is it complicated to update ? I thought this Zimlet would be great as I occassionally press 'CTRL Enter' by mistake and send an email before it's completed.However, this zimlet only works when you click the 'send' button, and not if you use the keyboard shortcut.If you could add this functionality, I would give it five stars. Hi there...excellent Zimlet! Both my users and I all love it. However...Say I go to the Tasks tab, and then go to the Mail tab and fire up a new mail...once I send it and click SEND NOW in the "undo send" window, I'll be forced back to my Tasks tab.Or, if I go to my Address Book and do the same thing, I'll be forced back to my Address Book.This has been tested and verified on Mac OS 10.6 and XP SP3 across multiple browsers.Is there any way to modify this so my users end up back in their Inboxes instead of wherever they were before they went to the Inbox?Thanks again!!! Really cool, but it seems it doesn't work if you use keyboard shortcut to send an e-mail instead of pressing 'send' button.